Based on bionics engineering principle found in nature, Aluminum Honeycomb is a kind of hexagonal structure similar to bee honey comb, made of aluminum foil type 3003, 5052, 5056, for different usage purpose. 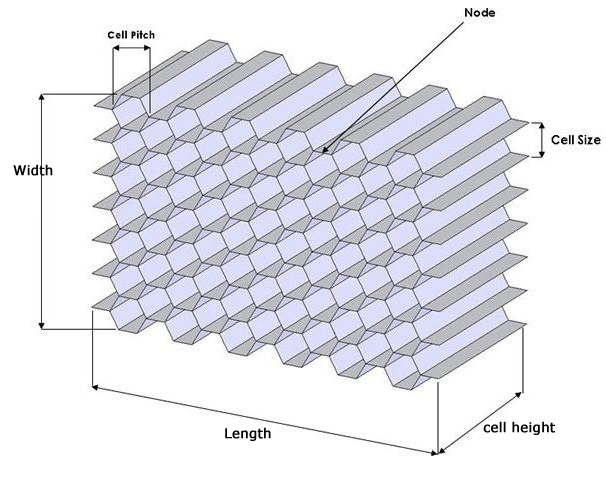 It is available in cell sizes ranging from 3 mm to 25 mm, and in foil gauges from 40 µm to 110 µ.m aluminum honeycomb is available in unexpanded block, unexpanded slice and expanded sheet. Aluminium honeycomb is an ideal material for a wide variety of industrial applications where elevated physical and mechanical properties are not required, such as air or light directionalization, energy absorption, tooling, ceiling and floor panels, counter tops. 1. Corrosion resistant. According to test, there is no change after 24 hours exposure to 2% HCL solution, or 24hours exposure to Ca(OH)2 solution.